The teeth at the back of our mouths — the molars — have a series of bumps, ridges, and grooves across the chewing surface. This complex dental landscape is the product of the spatial arrangement of cusps, which are conical surface projections that crush food before swallowing. How many cusps there are, how they are positioned, and what size and shape they take together determine our molar's overall form or configuration. In a study published this week in Science Advances, an international team of researchers from Arizona State University's Institute of Human Origins and School of Human Evolution and Social Change, New York University, University of Kent, and the Max Planck Institute for Evolutionary Anthropology found that a simple, straightforward developmental rule — the "patterning cascade" — is powerful enough to explain the massive variability in molar crown configuration over the past 15 million years of ape and human evolution. Publication: Alejandra Ortiz, Shara E. Bailey, Gary T. Schwartz, Jean-Jacques Hublin, Matthew M. Skinner. 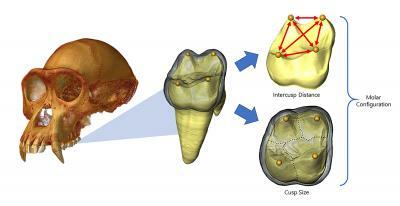 (2018) Evo-devo models of tooth development and the origin of hominoid molar diversity. Science Advances.